Keeping track of what’s going on in the world of low-impact, sustainable housing is, and was, a challenge. We did a study for CMHC back in the early 00’s looking for great examples for a series of case studies that required collecting a ton of info on many projects. CMHC published only 3 of 24 case studies, but we had hundreds of submissions to a survey that we sent out to over 7,000 design professionals in 2004 and 2005. The common theme is that the programs, and the projects themselves, went far beyond being energy efficient. They all address a broad range of concerns about environmental impacts throughout the lifecycle of a house – from site selection through design and materials choices, construction, operation, maintenance and demolition. 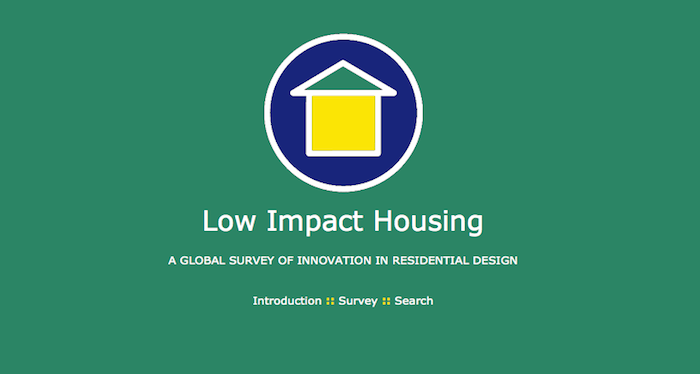 The Low Impact Housing database is still online, kept up by Sealevel Special Projects because it’s a cool resource. Link it to other organizations compiling case studies! Please sign up for the Bfreehomes newsletter to get all the good stuff.